It has been a remarkable year for Pilipinas Shell with six automobile manufacturers recommending Shell as their fuel of choice in the Philippines. These include: Mazda, Subaru, the Autohub Group―the local dealer of Mini Cooper and Vespa -- Hyundai, Toyota Manila Bay, and Toyota Talisay in Cebu. They add to Shell’s prevailing global partnerships with Ferrari, BMW-M, and Ducati. 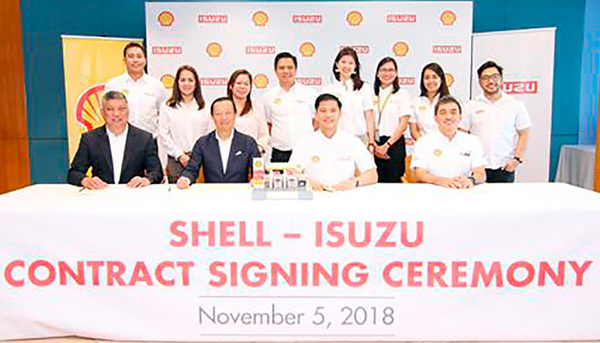 And to wrap up a prolific year, Shell adds Isuzu Philippines Corporation (IPC) to its roster of affiliates through a memorandum of agreement signing ceremony held recently at Top of the Citi in Makati. Seatedfrom left): The Memorandum of Agreement Signing Ceremony was led by IPC Division Head of Marketing Joseph Bautista, IPC President Hajime Koso, Pilipinas Shell President and CEO Cesar Romero, and Pilipinas Shell Vice President for Retail Anthony Lawrence Yam.At the back are Pilipinas Shell Brands and Marketing team and IPC Corporate Communications team. In attendance were Pilipinas Shell President and CEO Cesar Romero, Pilipinas Shell Vice President for Retail Anthony Lawrence Yam, IPC President Hajime Koso, and IPC Division Head of Marketing Joseph Bautista. With this agreement, Shell and IPC will be collaborating on various value-added offers to delight their loyal customers and help them have better journeys in the succeeding year. As IPC now recommends Shell Fuels as the best partner for their vehicles, a Shell Welcome Kit will be given along with every new Isuzu vehicle purchase. Every customer who buys an Isuzu car, will also receive 5k worth of Shell fuel vouchers plus a welcome kit that contains P600 worth of additional Shell fuel vouchers and information booklet. “We highly value this partnership with the leading diesel-powered light commercial vehicles and trucks brand in the Philippines,” Romero said. He noted that the two powerhouse companies already have an existing tie up on commercial vehicles and fuels, but this is a first for Retail. For his part, Bautista expressed confidence that the partnership is just the beginning of something bigger and better in the years to come. “With the synergy of these two global brands, we can come stronger for 2019 and beyond,” he said.